Gayle Mason (Fur in the Paint) has done a very nice post about a Comparison of Pastelmat, Pastelbord and Fisher 400 paper which summarises the relative merits of different supports for coloured pencil work. I'm going to highlight each product in turn and reference the relevant websites, others who have produced reviews and produce a summary for each type of support. Technical Details: A smooth cork grained surface available in different colours. Two sizes of acid free 360g/m2 (170lb) sheet available: 50 x 70cms (19.75" x 27.5") or 70 x 100cm's. Also available in smaller sizes as pastelmat pads. Version 2 of the Pastelmat pad: colours are Brown, Sienna, Anthracite and White. Pads are available in 3 different formats. Each pad contains 4 shades x 3 sheets. Each sheet is protected by a crystal insert. 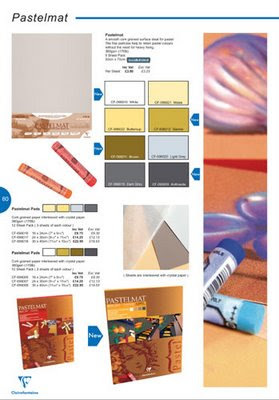 Summary: Suitable for soft or hard pastels, pastel pencils and coloured pencils. Suitable for: Realistic art using coloured pencils or pastel pencils. Enables both fine lines and smudged/softness. Brown ClaireFontaine PastelMat: Anyone know how to permanently erase from this paper? I've tried kneaded putty erasers and everything else under the sun, but to no avail. I'm using Terry Ludwig pastels. My other option would be to match the brown color and cover unwanted marks that way but I can't find a precise match to the brown paper in any make of pastel. Any ideas? Brown ClaireFontaine PastelMat - I haven't been able to erase convincingly from this paper, using Terry Ludwig pastels. I've tried kneaded putty erasers and many other types - all to no avail. My other option would be to match the brown paper color and hide unwanted marks with a brand of brown pastel that matches precisely, but haven't found one of those yet either... Can anyone help/advise? Apologies if this question appears twice but the system seems to be ignoring postings without any acknowledgement... last attempt. I've been able to knock back using a Tuff eraser but never to get it completely clean again. Are you wanting to leave some of the support clean of pastel? I want to leave my background clean of early/erroneous marks and image shifts. Usually I cover the marks at the end but can't find a close enough matching color. I think it's very unlikely that you can get back to a clean surface. I've never come across a practice which covers some but not all the background which has not been covered in pastel. Either it's a drawing - and people generally leave all the early reference marks (mistakes and all) - or it's a painting and the whole surface is covered. Why not just cover the entire surface that's not the subject with another colour if you don't want the errors to show? Also if this is your practice I think you probably need to check that you've got a pastel which matches the colour of the support BEFORE you start. Read reviews about art books, art supplies and other products and services used by artists. My aim is to try and identify good quality and good value. These reviews will be added to the information, advice and reviews found in my "Making A Mark on Art" sites listed below. 2. 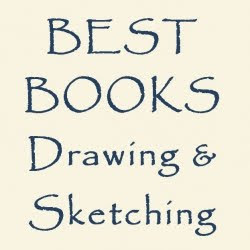 Comment about what you think about an art book, product or supplier. 3. Take part in regular opinion polls about which products or suppliers you like the best. Hemnes Bookcase x 4 for "The Art Library" #2 - RESULT! You can comment at the end of each post (click "comments"). Al comments are moderated and I see every comment. ...the best artist-quality watercolour paints? ...the best brand of artist grade coloured pencil? ...your favourite make of pastels? ...packing or shipping art - which is the biggest challenge? We're 99 Today! CalCedar's Centennial Year is Upon Us. Which is your favourite make of artist grade coloured pencil? The basic principle which underpins this blog is that all the reviews which appear here should be independent and unbiased. What does this mean? I have no financial relationship or formal affiliation with any suppliers of art materials, any publisher or any B&M art shop or art bookshop. I choose to buy the bulk of my art materials and art books from various shops and suppliers. I am sent review copies of books by various publishers or authors and samples of art materials by various suppliers of art materials. I always declare if I was sent a product as a sample. I am an Amazon affiliate and the Amazon search box and all links to books include an affiliate link via Squidoo or my own personal affiliate account. This means that if you buy a book as a result of clicking on one of these links I might earn a very small sum. (Income earned in this way helps me finance the purchase of new books). I expect all reviews by other artists which appear on this blog to adhere to the basic premise that any and all affiliations are declared.